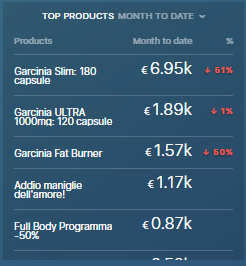 This dashboard investigates the different factors that affect monthly revenue for your e-commerce store. You can quickly miss out on thousands of dollars of revenue due to small issues in your e-commerce funnel. As an executive that oversees an e-commerce business across dozens of online stores in multiple markets, it’s critical for me to monitor real-time data for each store and immediately identify potential challenges to discuss with my teams. While there are dozens of metrics I could focus on, I best serve my business and team by avoiding micro-management and focusing on the big picture of what’s driving the business. We operate on monthly planning, so I like to focus on the month to date timeline, compared with equal days in the previous month. The real magic doesn’t come from constantly looking at where we are right now, but rather, looking at what has changed since the last comparable period. Change provides context, helping you immediately see where you’re doing better and where you need to improve. Revenue is simply a mathematical function of the traffic you’re generating to your site, your conversion rate and your average order value. Just by understanding this simple formula, you can instantly pinpoint the problem if your revenue is declining. Or, you can identify impactful changes when it’s increasing. In this simple example, revenue is down by 29% month to date. What happened? Simple. While the ecommerce conversion rate is more or less the same and average order value actually increased, we have a mission critical problem with sessions decreasing by 34%. 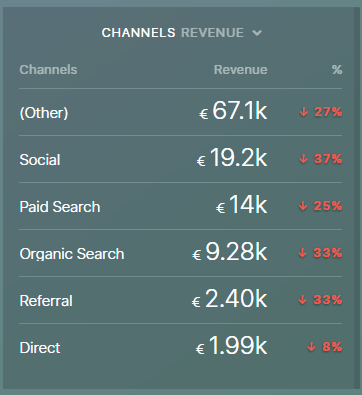 Now, no simple dashboard will give me all the answers on a single screen, but this is enough for me to start digging deeper, identifying the traffic sources or channels that decreased the most in traffic. Next it’s time to dig deeper into individual traffic channels. A simple report shows me what channels are doing better and what worse in terms of revenue, again compared to the previous period. After that, it’s just a matter of digging deeper in Google Analytics to get more insight into why they’re underperforming (traffic, conversions, average order value) and then optimize. This data block uses the »channel« dimension from Google Analytics to give a revenue breakdown. Make sure that you’ve properly set your channel data to capture each individual traffic channel you care about. You should not be worried necessarily when a certain channel, like Facebook advertising, is generating less revenue. Lower revenue can sometimes mean means higher profits, for example, if you manage to decrease your cost per customer acquisition. That’s why it’s a good idea to always include the channel cost data for your biggest channels in your report. In this case we’re looking at paid Facebook advertising and Google CPC, however you should spend some time to integrate the channels that matter to you. Just make sure that you don’t ignore the cost side, because revenue by itself isn’t the only figure in the profit equation. 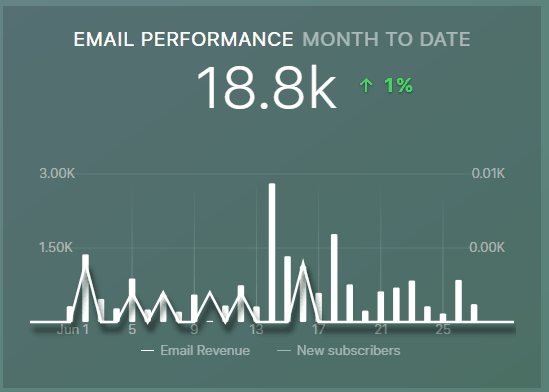 One or more of your channels might be so important or specific that you might actually want to keep a daily chart for the channel, for example, like here, a chart with daily email sales and new email subscribers. 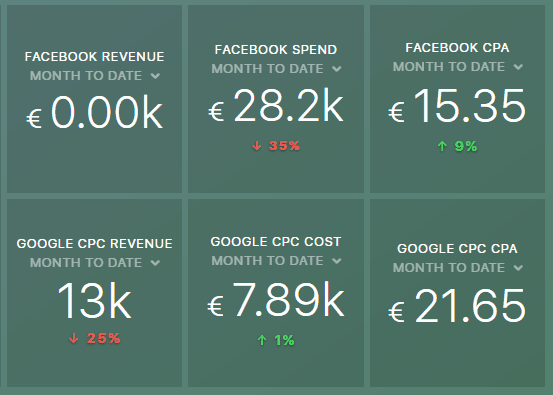 You can also make a chart with daily Facebook revenue and costs, or even a chart where you create a calculated metric for revenue from all of your paid channels and compare it with a calculated metric from all of your paid advertising costs. The reason for your decreasing or increasing sales might not always be in your activities, but in certain products going out of season or into season. It’s critical to keep a careful eye on your top movers and shakers to react on time and change your strategy. Use the Top Products data block for a quick glimpse at your bestsellers to see which are growing and which might be going down. Then simply consider the possible causes. Is it still the right season for the products you’re pushing? 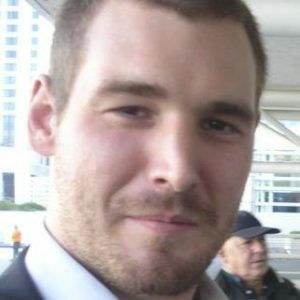 Are competitors doing something you should be aware of? Are your individual product campaigns performing worse than in the past? Looking at bestseller movements provides much-needed context to your overall and channel performance. 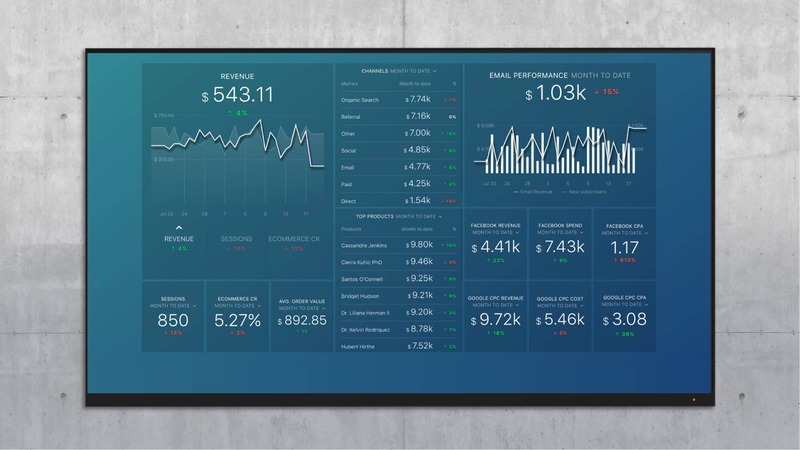 Ultimately, every dashboard you use needs to tell the specific story of your business and what’s driving it. Think of the dashboard template we just went through as a starting point. Then adapt it to the specifics of your business. Remember, always focus on your key business drivers, whatever they may be. 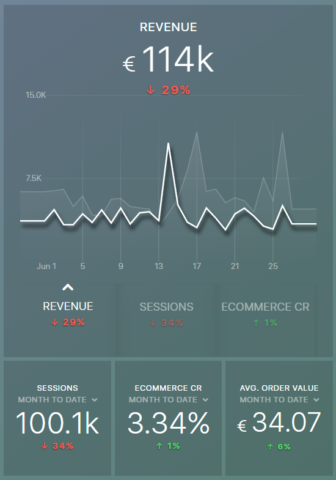 Here is my entire Ecommerce Overview dashboard if you would like to use if yourself to track data in real-time for free. It works with Google Analytics, MailChimp, AdWords and Facebook Ads. Rok Hrastnik is an international multichannel and ecommerce manager, with a strong background from Central & Eastern Europe, as well as experience from the US and UK.